The Indian Railways plans to offer end-to-end travel solutions for its passengers including booking cabs, buses, flights and hotels through a new mobile application. In addition, the national carrier intends to involve cab aggregators and also offer an e-commerce platform by developing this integrated mobile application and has appointed EY as consultants for the project. Around Rs.500 crore is expected as revenue potential from the mobile app being developed by its subsidiary, the Indian Railway Catering and Tourism Corp. (IRCTC) that handles catering, tourism and online ticketing operations. IRCTC has an app—IRCTC Connect, which is meant for booking railway and flight tickets. Also, its website offers services such as booking cabs, buses and hotels. "We were ahead in the e-ticket race but in the app department we have fallen behind. IRCTC just has a transactional app which doesn't bring in much money. 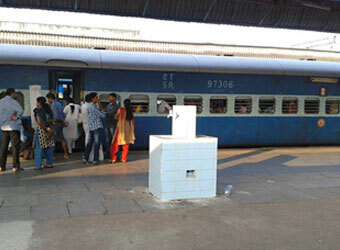 We need to grow further," said a railway ministry official requesting anonymity. The development assumes importance given the size and potential of the Indian travel and e-commerce market. While the travel market in India is estimated to reach $40 billion by 2020; the e-commerce industry is expected to reach $100 billion by 2020, according to a Deloitte report. "We want to provide services for the entire journey. Basically, the aim is for the app to map the entire journey for the passenger and provide the best travel option because, right now, that is not being covered. The estimated revenue from just the taxi integration into the app is around Rs.100-150 crore," said another railway ministry official requesting anonymity. The national carrier's subsidiary—Centre for Railway Information Systems (CRIS)—will be involved in the back-end operations for the app development. "CRIS will be involved in the back-end part of it and IRCTC should be the monetisation front. We are working on the modalitiesâ€¦ We have asked EY to put in a team for this to let us know shortly what the best strategy is," the official said. The railways had partnered with consulting firm EY in March 2016 to tap advertising potential at stations and on trains. The ministry had then estimated advertising potential in excess of Rs.5,000 crore over the next few years. This comes at a time when the national carrier is under financial stress and is looking to monetise all available resources. It plans to increase its non-fare revenue from the current 5% to 10-20%, as is a norm for many railway systems across the world. "We are looking to create an ecosystem for setting the best app for travelling and other services including booking hotels, cabs, bus and flight tickets, e-commerce, among others. It will offer a comprehensive travel option for the passenger, and is being prepared by EY through IRCTC. We are weighing options regarding how to go about it; whether we should make it ourselves or involve other players," said the first railway ministry official quoted above. The national carrier's passenger business incurred a loss of Rs.33,000 crore in financial year 2014-15. There is a need for revenue generation as the almost 175-year old transportation system estimates to spend Rs.70,125 crore on wage bill and Rs.23,010 crore as fuel expenses. Railway minister Suresh Prabhu in his budget speech for the current financial year said the railways had different digital solutions for ticketing, grievance redressal and other issues. Queries mailed to the spokespersons of the ministry of railways, IRCTC, CRIS and EY on 26 September remained unanswered. Experts say that anything which enhances the consumer experience is a good proposition. "Anything which gives consumers an integrated choice as per location is good and should be appreciated. It will be difficult to comment on the revenue model as of now. The overall focus for the railways is to enhance non-fare revenue, and if you can give more value to the consumer and get something out of his wallet that is the certainly the right strategy," said Arvind Mahajan, partner and head, infrastructure and government services, at consulting firm KPMG.